For her second solo show at Galerie Jean Fournier Dominique De Beir is offering Annexes et Digressions 3 / Additions and Digressions 3, a stage in a series of five exhibitions designed as five chapters and unfolding between October 2018 and December 2019. 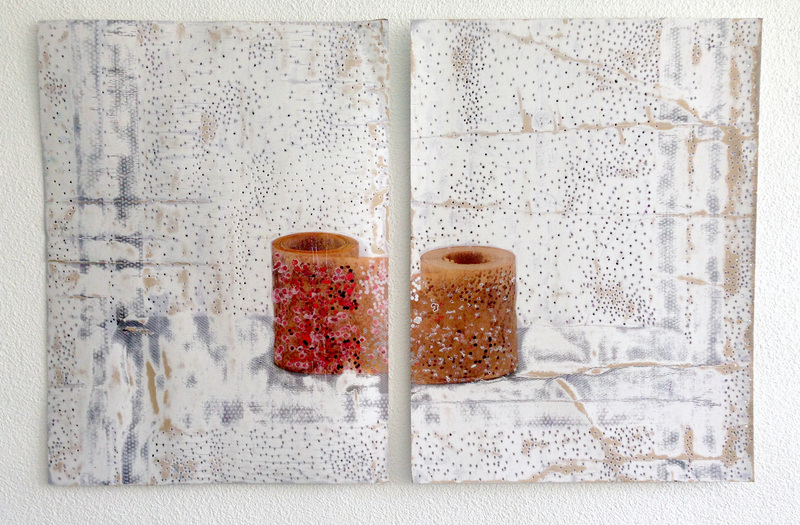 De Beir’s relationship with the physical substance of her work is an ambiguous one: violently and mechanically she burns, abrades, perforates and digs into her polystyrene, cardboard and paper; yet taken together the effects – degradation of wholeness, form and colour – yield poetic abstract compositions. Poetic in their revelation of a sensitivity to materials often regarded as « crude » and a capacity to « ennoble » them. Transcendence through demolition. Stark gesture-­‐driven beauty. There is something deliberately carnal going on between her and the stuff she works on, something calling for everyday tools – scalpel, punch, stylus – and others, such as these studded boots, designed in conjunction with tradesmen. For this exhibition De Beir is presenting the innovative pieces she calls Digressions. Items from the monograph, blown up and reworked to become works in their own right. An exercise in mise en abîme for bringing to the fore her « modes of exploration and work procedures. » Other works from different periods will be on show in a further harking-­‐back to the monograph, while the exhibition itself will be punctuated by various events illustrating the encounters, ideas and artworks that fuel De Beir’s creative process: Stéphanie Guglielmetti will present her new book during International Women’s Day; Béatrice Cussol will read unpublished texts; and Tania Vladova and Dominique De Beir will discuss the Annexes et Digressions publication that accompanies the series of exhibitions. Published by Friville, Annexes et Digressions is an artist’s book designed as an extension of the earlier monograph, an evolving « meta-­‐book » that will be added to in the course of the exhibitions. It will notably include the 15 Digressions plates and Le Feuillet (The Page), with a text by Tania Vladova illustrated by Dominique De Beir. Items from the other 4 exhibitions will also be featured.